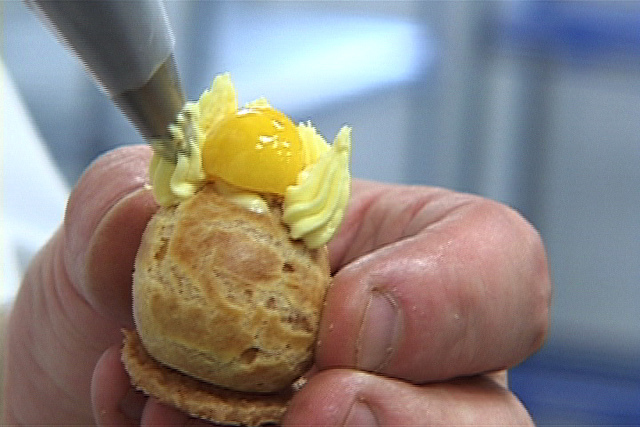 Dessertbuzz | Dessert DVD: Kings of Pastry A heartbreakingly real documentary now available in your home! KINGS OF PASTRY will be available on DVD February 22. Included DVD extras: Chef Jacquy Pfeiffer creating a chocolate sculpture, Interview with the filmmakers, and a Chocolate Fashion Show. Order yours here. $20.96. “The Kings of Pastry“, a documentary by D.A. Penebaker and Chris Hedgedus focuses on 4 pastry chefs’ voyage to attempt to earn the title ‘MOF’ (Meilleur Ouvrier de France). MOF is a French National award given to the best craftsman in their respective field, and the highest award for a pastry chef in France (it should be noted that the title MOF is given to masters in crafts as diverse as window making and chocolate making; Pastry is just one such competition albeit perhaps the most prestigious). One of the creations from "kings of Pastry"
The standards for the award are stringent, exacting and daunting. For the pastry category a field of approximately 90 pastry chefs who have distinguished themselves for consideration is narrowed down to 16 candidates by a panel consisting of other chefs who have achieved MOF. Once the 16 are chosen, the contest begins. Well, truth be told, the contestants can spend years preparing, and once they know they are in the competition they devote months to practice and often take as many as 6 weeks to do nothing but rehearse their contest plan. The contest, unlike what we are used to seeing in the US where candidates compete against each other, compete against only one thing: standards. Unassailable, unwavering, standards judged by MOF awardees who all want the candidates to achieve MOF but will, under NO circumstances, allow any standard to not be properly enforced. The candidates, all 16, could achieve MOF. Likewise, none could achieve MOF – it all rests on if the standards are met. The candidates have 3 long days (which start ever earlier as the contest progresses) to complete somewhere in the neighborhood of 40 different pastry and sugar related items related to a theme. All the time, the judges are present watching their every move and judging everything from cleanliness to (seemingly) choreography in their movements. Beauty is essential in each step, literally in their movements as well as their choices as to how to prepare the dishes. The judges look at not only taste which, while judged is almost assumed somehow, but visual beauty, textural beauty, the beauty of process and respect for materials. 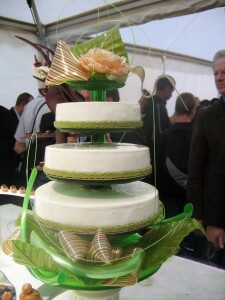 It is hard to imagine making 40 different desserts in these conditions but add to this the showpiece: a large sugar ‘sculpture’ which each candidate must create and are typically 3 feet high or more, unbelievably delicate and intricate, and, in a final challenge, must be carried by the chef to the presentation tables through what is functionally an obstacle course. Did I mention that is the last thing they must do after 3 days of work and little sleep? It is so daunting that one chef even makes a custom hydraulic base for his so that as he sets it down it will slowly lower itself to the table to avoid potentially breaking. 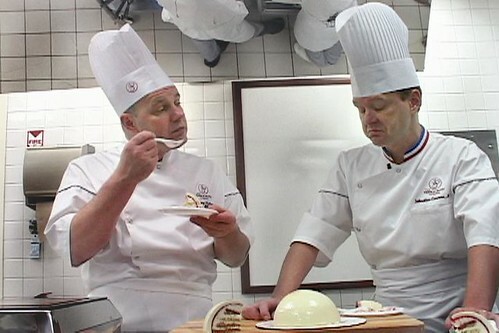 Those that meet the standards are awarded MOF and are given the ultimate in status for their craft the right to wear a collar on their chefs jacket the highest honor that they can achieve and is essentially the crown making them a ‘king of pastry’ (it is pointed out early in the film that to wear this striped collar and not have achieved MOF is, in France, punishable by imprisonment). I did the math – the contest is held every 4 years. At most 16 chefs can achieve MOF each contest. An average career for a pastry chef (at this level, after distinguishing themselves to the level where they can compete!) is perhaps 40 years. So – the maximin number of MOF’s at any time is 160. Now – 16 winning in a given year (let alone every year) is not likely, probably unheard of, so my guess is that there are probably 40 – 80 at any one time. Exiting the film, I was exhausted from the competition. 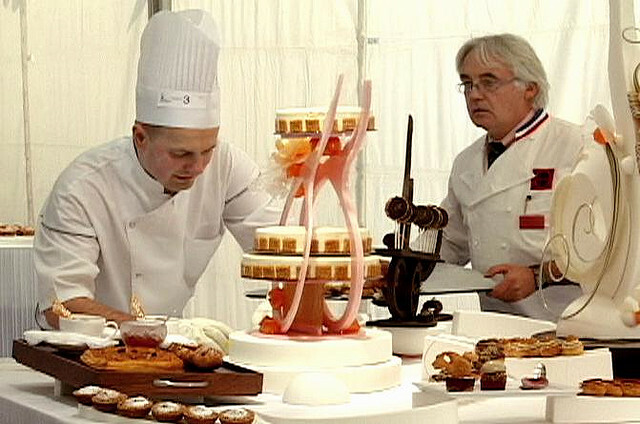 In an early scene we see Jacquy Pfeiffer through a practice session for a single cake in the competition – one that involved extensive sketches, 13 layers, discussions of how the taste will be affected by the placement of the layers, 4 textures, flash-freezing, baking, mousse, sponge, forms, and multiple temperatures at once only to see the fruits of this labor (about 3 hours!?!) to be tasted, with one bite, declared ‘a bit too sweet’, and summarily, dispassionately, discarded. I was crushed. Little did I know that the film was allowing me to callous early or I would not have been able to make it through. This cake alone would be, for me, a somewhat accomplished amateur baker – my masterpiece. To him, it was one day’s experiment that did not work; simply butter, sugar, flour, eggs and fruit which were not right in the end. This effort and response to the work is typical throughout the film. We see all 4 candidates try many of the different elements which will be created during the competition – on their own each a complex, difficult, and honed achievement. The attitude toward everything they make is similar – take the materials, work them, make their creation beautiful and taste wonderful so that all aspects of the experience will delight, and, if not, try again with changes. All of the chefs seem to be able to create anything they want; the question is what do they want to create, what is their vision, what taste and experience do they value and not ‘can I make it’. While some of the contestants try to guess what will please the judges (hence the title of this review) all the judges advise to “Express ourself and your love of pastry”. The ultimate MOF shows himself through his skill and work, his aesthetic and craft and the craft serves this expression. A great message to us all. It is hard to miss the sheer aesthetic of everything that is made in the film. However, the filmmakers also beautifully and intimately chronicle the lives of 4 contestants focusing on Jacquy Pfeiffer in Chicago. We see the human rather than the sensational side of their work and struggle. By the time the awards are announced, there are tears in the eyes of the announcer and many in the audience both within the film and also in the theater during the screening (yes, really). This happened in the screening because the filmmakers were able to capture who was working, what it means to them and not simply the sensational aspects if the event. The film making style – digital cameras, personal, immediate – is such a lovely contrast to the glut of poor ‘reality’ TV and film we see now; the difference is clear when a professional, talented film maker takes the camera and the story. What we get is the human, the humane, the art, the beauty of life and not simply a narrative about which we can create a sound bite. This film is a film – one that shows us people and beauty. Kings of Pastry stands out as a heartbreakingly real documentary in a world where there is so much superfical garbage. KINGS OF PASTRY available on DVD February 22. 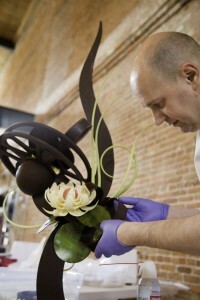 The DVD extras: Chef Jacquy Pfeiffer creating a chocolate sculpture, Interview with thefilmmakers, and, a Chocolate Fashion Show. Order yours here. $20.96. The Kings of Pastry Website is here. That was a good one. Just watched it. Now I see why they made such a big deal out of the chef at my favorite patisserie, Jean Millet, getting the MOF designation recently. Yeah, the mof is as real deal as it gets. Years of preparation just for the test.